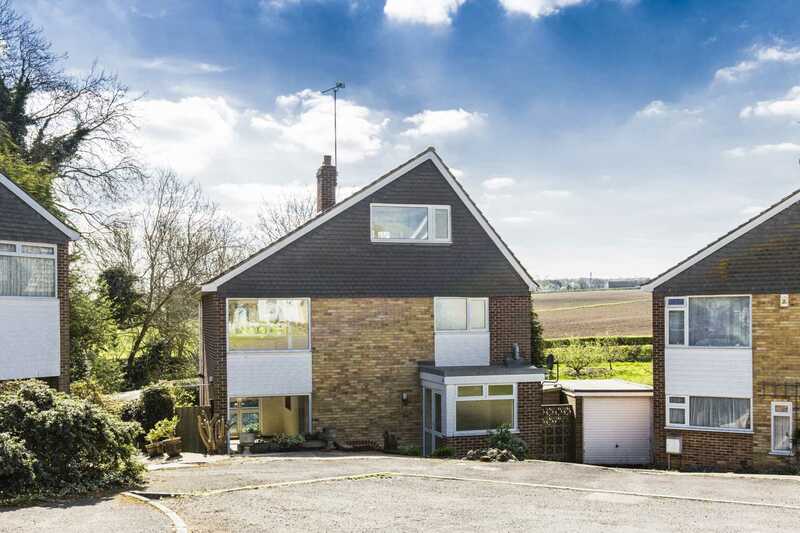 SOLD BY FLYING FISH PROPERTIES With space and light in abundance this contemporary designed home is beautifully situated on a quiet cul-de-sac within walking distance of the mainline station, church, village shops and popular primary school. 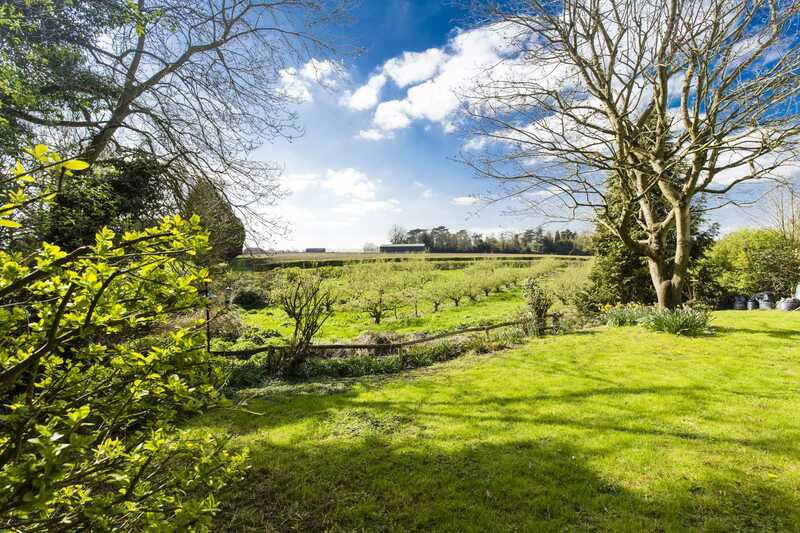 It is framed by open countryside views stretching as far as the eye can see ensuring you an unspoilt outlook over orchards and fields. 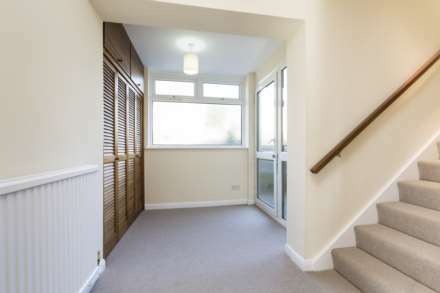 A part glazed porch leads into the wide entrance hallway with a guest cloakroom and double storage cupboards which provide plenty of space for coats to keep the hallway clutter free. At the end of the hallway is a tranquil bedroom whose cream walls beautifully contrast with the warmth of the wooden effect flooring. 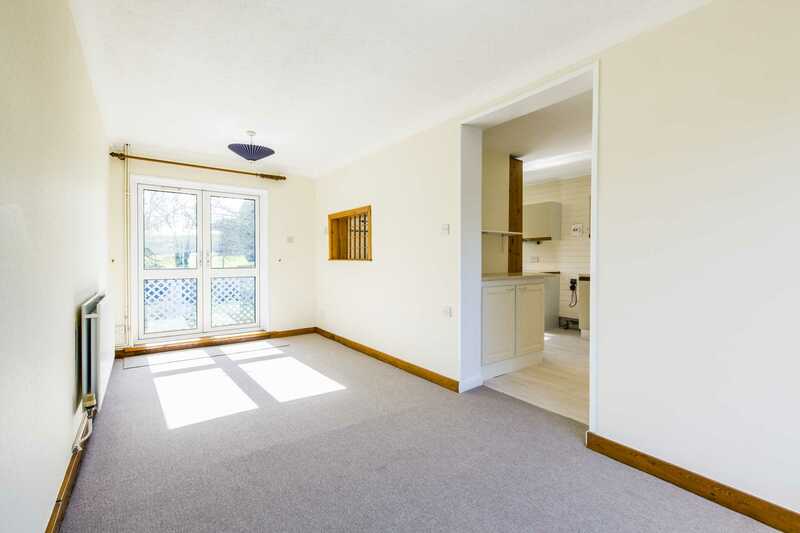 Next door is the wonderfully bright kitchen with its sink placed under the window giving you leafy green garden and orchard views as you wash up. 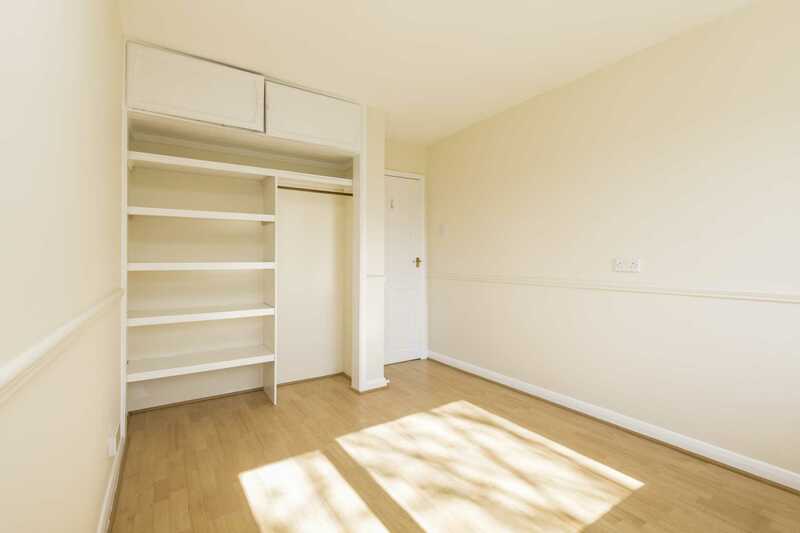 There are plenty of eye and base level units, a useful serving hatch and an opening into the dining room. The dining room, conveniently placed next to the kitchen, has plenty of space for a table and chairs. It is dual aspect and has fully glazed French doors opening onto the raised balcony at the rear, making the space feel warm and bright. Climbing the stairs, you arrive in the substantial living room that runs the depth of the house. 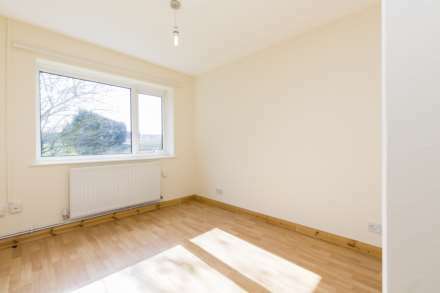 It has a focal fireplace and an impressively large window at the rear flooding the room with natural light. 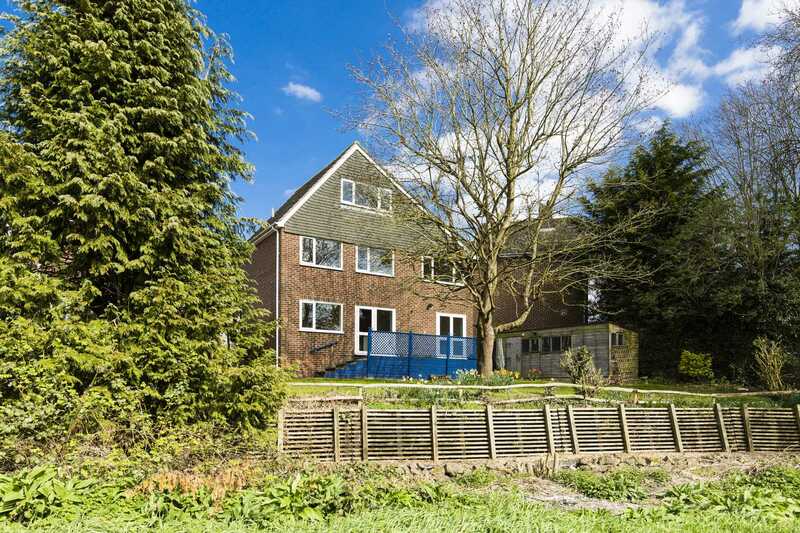 A modern bathroom and two further bedrooms which are immaculate and generously sized complete the first floor. A further flight of stairs take you up to the second floor`s master bedroom which enjoys stunning countryside views. 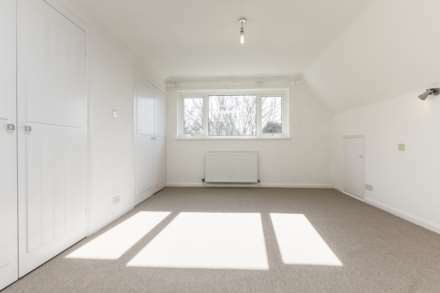 It has its own en suite shower room and an entire wall of fitted wardrobes. Outside a sunny and broad south facing garden that descends downwards is laid mainly to lawn with mature shrubs, trees and flowers framing its boundaries. A paved terrace offers perfect summer evening alfresco dining whilst a wooden gate at the rear gives access to a stream.There are two sheds and a workshop in the back garden; the latter is insulated with power and lighting. 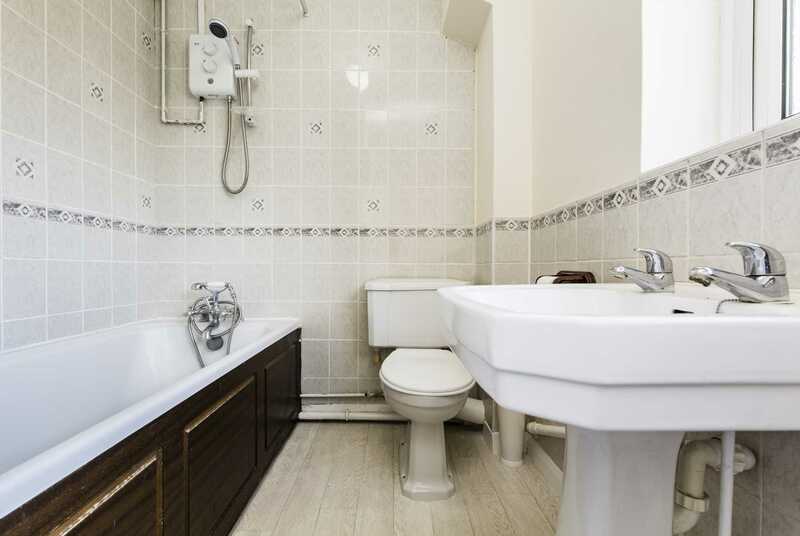 Cloakroom: with opaque double gazed side aspect window, low level WC, corner wall mounted hand wash basin with wall tiling behind and radiator. Bedroom 4: 11`11 x 8`10` rear aspect double glazed window, fitted open shelving and hanging rail with cupboards above, wooden effect laminate flooring and radiator. 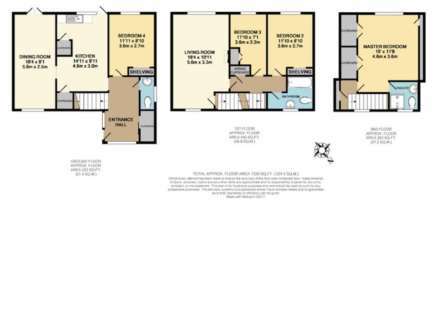 Kitchen: 14`11 x 9`11` rear aspect double glazed window and double glazed door onto raised balcony. 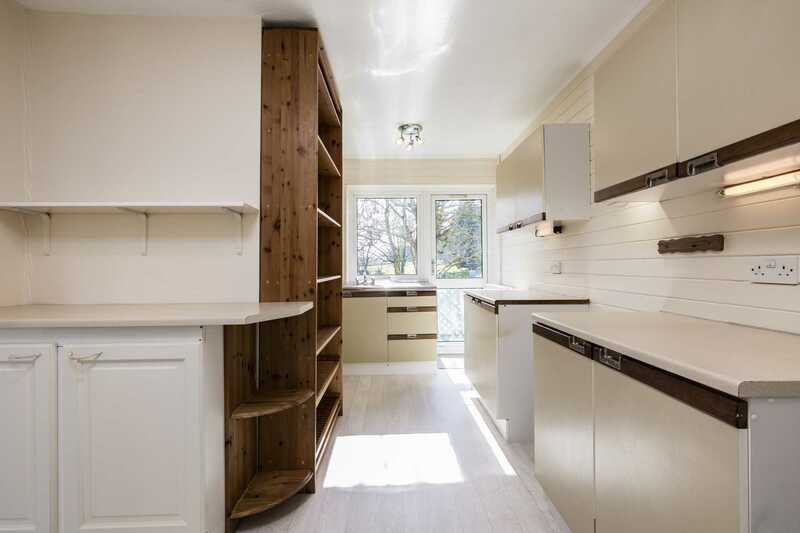 There is plenty of work top space, a selection of neutral and wooden effect eye and base level units with open display cabinetry and two deep storage cupboards one of which is under the stairs. 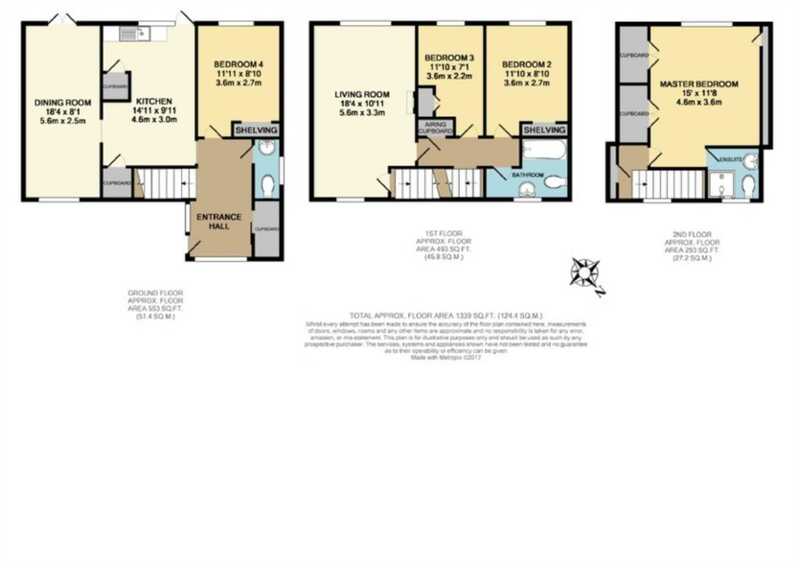 There is a stainless steel sink with drainer and mixer tap over, space for an oven and hob, space for a fridge/freezer, space and plumbing for a washing machine and dishwasher, a radiator and white oak effect vinyl flooring. There is a serving hatch and an open square arch into the dining room. Dining Room: 18`4 x 8`1` front aspect double glazed window and double glazed rear aspect French doors leading onto the raised balcony and radiator. 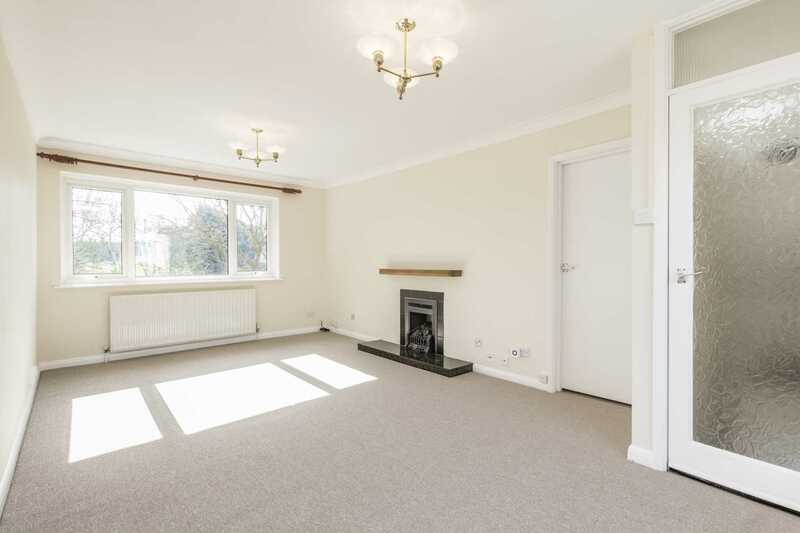 Living Room: 18`4 x 10`11` front and rear aspect double glazed windows, raised hearth and surround with inset gas fire with oak shelf over. Bathroom: opaque front aspect double glazed window, white oak-effect vinyl flooring, panelled white bath with hand held shower attachment and wall mounted shower over, pedestal wash basin, low level WC and part tiled walls. 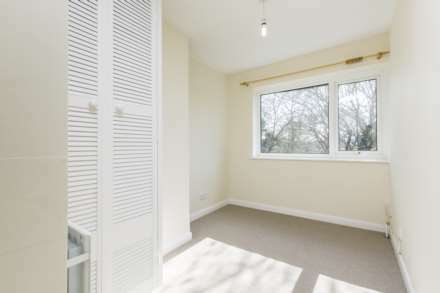 Bedroom 2: 11`10 x 8`10` rear aspect double glazed window, fitted shelving, wooden effect laminate flooring and radiator. Bedroom 3: 11`10 x 7`1` rear aspect double glazed window, wooden slatted fitted single wardrobe with hanging rail and radiator. 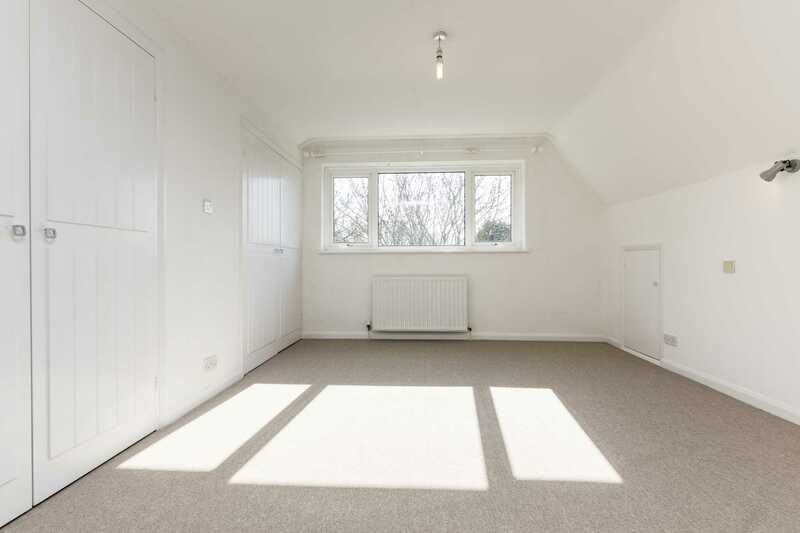 Bedroom 1: 15` x 11`8` rear aspect double glazed window overlooking the garden, internal front aspect window, two double built in wardrobes with hanging rails, eaves storage cupboards with lighting, loft access and radiator. 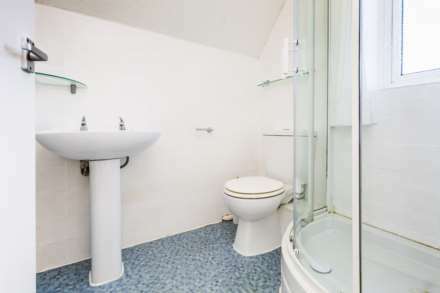 En suite: front aspect opaque double glazed window, corner shower cubicle with wall mounted shower, pedestal wash hand basin, low level WC, tiled walls, vinyl flooring and radiator. 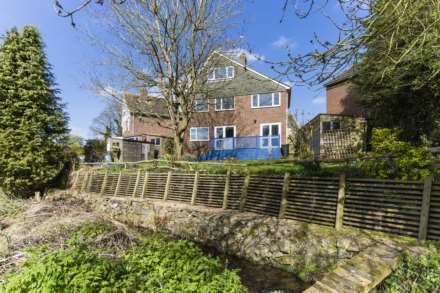 Outside: to the front of the property is a concrete drive with parking for several cars. To the rear is a garden laid mainly to lawn with mature shrubs and trees, a paved terrace area for entertaining and access to the front of the property. A wooden enclosed balcony at the rear of the dining room and kitchen leads to steps down to the garden. 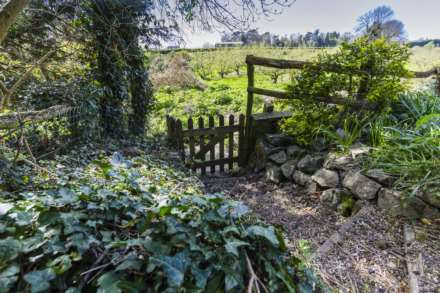 There are natural steps down to a wooden gate at the rear giving access to the stream. There are two sheds and a workshop in the back garden; the latter is insulated with power and lighting. Wateringbury is a pretty village which lies to the west of Maidstone that has glorious open countryside on its doorstep and the River Medway running along its southerly edge. 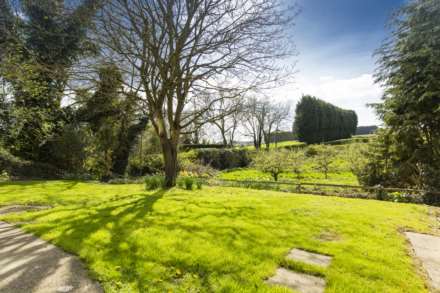 It has a friendly community spirit with a village hall and it also has the convenience of local shops, an antique tea room, restaurant and hotel. 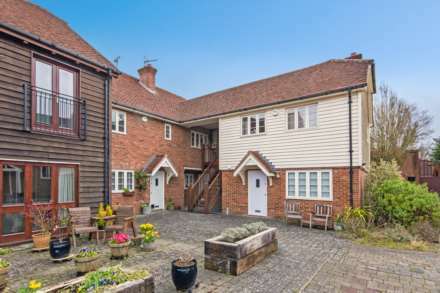 It has good transport links with nearby access to M20 and M25 and its railway station services trains from Maidstone West and has a link to London via Paddock Wood to London Bridge and Charing Cross in just under an hour. 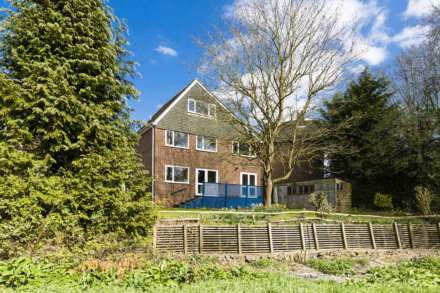 Just a short distance away, West Malling station also services direct trains to London Victoria and nearby Paddock Wood services trains to Gatwick airport. 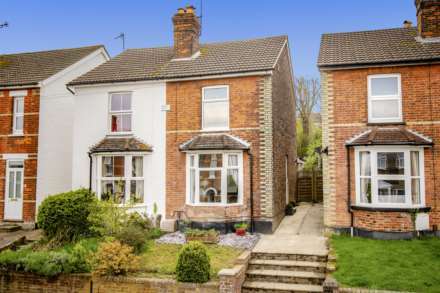 Wateringbury has its own excellent primary school and parish church (St John The Baptist), but it is also close to the towns of Maidstone, Sevenoaks, Tonbridge and Tunbridge Wells with their highly regarded state, grammar and independent schools.